How Far is Marutham Galaxy? Marutham Group is coming up with elegant residential apartments at Udayampalayam titled Marutham Galaxy. Each apartment is carefully designed for the best look, beautiful interiors, sufficient ventilation and offered with world class amenities. 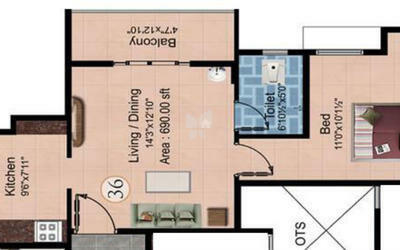 Offered in a range of 1 BHK, 2 BHK and 3 BHK, these are built with top branded flooring's and fittings. RCC framed structure with concrete block/brick walls. Good quality of ceramic tiles for flooring. Bathroom Doors : Single paneled PVC doors. Raised cooking platform with black granite top and stainless steel sink. Glazed tiles will be provided for a height of two feet for the length of the cooking platform. Marble slab shelves will be provided. Good quality ceramic tiles flooring (Matt Finish) and dado with glazed tiles up to 7 feet height. Good quality of CP fittings will be provided with hot and cold water mixer. Concealed water line. White or Light colour western type closet. One white or light colour medium size single tap wash basin. Imported cornice will be provided in the living room/dinning. Ground water with sufficient depth to give continuous water supply with overhead tank fitted with motor and pump with automatic water level controller. A Sump with motor will be provided in the ground to store the corporation water and a separate overhead tank will be provided on the roof to facilitate supply only in the kitchen. Interlocking pavement blocks and the premises will be provided with masonary compound wall and MS Grill gates. Good quality closets and wash basins. Concealed copper wiring in PVC conduits with good quality copper cables will be provided. Semi—Modular switches. Concealed telephone wiring will be provided. Putty finish with emulsion paint for walls. Synthetic enamel paints for doors. Brick bats with the lime mortar. finish with good quality pressed tiles. As per requirement of the purchaser at extra cost. Marutham Group - An ISO 9001: 2008 Certified Company, enjoys an envious position in the housing sector in Chennai, Coimbatore, Thiruvananthapuram, Bengaluru Puducherry and Cuddalore in the southern part of India. Marutham Group has to its credit millions of square feet built up area. Marutham is strongly committed to providing excellence in whatever it does. Marutham always strives to offer the best to its customers in terms of quality & service. Marutham group has crafted some unique projects such as Marutham Breeze which is developed with ready to occupy 2 & 3BHK apartments for sale in Tambaram West, Chennai. Marutham Icon one of the under-construction projects of the builder is planned with compact 2BHK’s and spacious 3BHK for sale in Pudupakkam, Chennai. Marutham has an untarnished record of handing over all the projects before the stipulated time. One of the elegant rich projects of the builder is Marutham Prestige which is built for small 1BHK lovers, well-planned 2BHK and 3BHK flats in Tambaram West, Tambaram, Chennai. Marutham also offers its services in bedecking interiors in an elegant way as per customer needs. Marutham blends the age-old traditions of Vaasthu–Shasthra with new age architectural innovations. • To create affordable residential dwellings for the needy. • To inspire comfortable living for the middle-income group. • To build value consistently by ethical business in the long run. Right from the selection of locations till the handing over the premises to the customers, we keep a microscopic eye in quality aspects connected with the execution of the projects. Understanding the minds of the customers is the most important aspect in the creation of their Dream Homes. High degree of participation, teamwork, creativity, and motivation are always promoted by the company. We assure you that only quality materials are incorporated in the construction and only transparent dealings are promoted in all our business dealings.